Finding a great deal on a Western Saddle Carry Bag can be difficult. But do not worry as we have a vast selection of Western Saddle Bags that are not just made of superb quality but also affordable. These particular Saddle Carry Bags have a heavy duty zipper which opens the front of the bag to easily place your saddle inside. 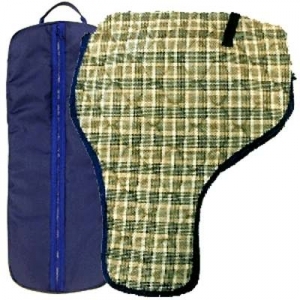 The bag is also made from a combination of padded and quilted material for greater protection, also offers adjustable web carry strap as well as grip for additional care. Our High Spirit Western Saddle Carry Bag is one of our best selling Western Saddle Bag because its a great product made with unsurpassable craftsmanship, But also very affordably priced.